As an alternative to borrowing from banks, companies can issue bonds to raise cash. This is particularly attractive for larger corporations who can afford the associated fixed costs such as acquiring a rating, marketing the bonds to international investors, and underwriting fees. Companies don’t necessarily need to issue in their domestic currency. They may have a need for foreign currency or find that issuing in a foreign currency is cheaper, even after they hedge the currency risk with a cross currency swap. Companies with UK operations naturally have more reason to issue in sterling, but sterling has also long been one of the few currencies used for international issuance. Indeed, foreign corporations issued more in sterling than UK companies in 2000, 2002, 2004 and 2009 (note, all facts and data in this post refer to “private non-financial corporations”, or PNFCs). Traditionally the comparative advantage of sterling issuance has been the steady demand for long-term debt from sterling investors such as life insurers and pension funds. As a result, the average maturity of sterling corporate bonds is 13 years, compared to 10 years and 6 years for dollars and euros respectively. Gross sterling issuance has declined every year since 2012, with both foreign and domestic PNFC issuance falling over this period (Chart 1). While UK company bond issuance in all currencies has declined since 2012, domestic companies have also reduced the share of their issuance in sterling. Meanwhile global issuance in other currencies – particularly dollar and euro – has continued to grow. Consequently, sterling’s share of global issuance has declined from 6% in 2006 to less than 2% in 2015, its lowest level since records began (Chart 2). The decline of sterling’s share of the global market has been particularly marked at the long-end. In 2006, a quarter of global bond issuance with a maturity of 15 years or more was in sterling; in 2015 it was just 4% – the lowest since 1997 (Chart 3). One place where sterling has not lost its lustre is the issuance of lower rated corporate bonds (rating BB and below, once known as “junk bonds” but now typically labelled “high yield”). There its global share of issuance has generally risen since the crisis, from a low base. Black line is sterling issuance as share of global issuance. Red line is sterling IG issuance as share of global IG issuance. 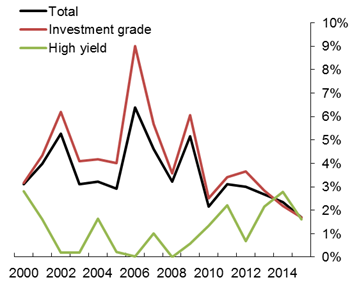 Green line is sterling HY issuance as share of global HY issuance. Competition from the ongoing development of the long-end of the euro denominated corporate bond market. Contacts cited the relatively concentrated investor base for sterling corporate bonds as one of the key reason it could be more attractive to issue in other currencies. Recent mergers among UK institutional investors appear to have made the sterling investor base even more concentrated. In order to be confident that a bond issuance will be successful, issuers and the investment banks arranging and underwriting the deal therefore need to be confident that several of the largest investors will take part in the deal. That means offering attractive terms to these investors – and thus higher borrowing costs for the company. With a small number of investors holding a large share of the bonds, contacts also say that it can be more difficult to sell sterling bonds in the secondary market, compared to dollar or euro bonds – that is, market liquidity is lower. This makes investors more reluctant to buy sterling bonds in the first place unless they are compensated by higher yields. Another implication of the concentration of the sterling investor base is that the behaviour of these large investors shapes the nature of the market. The large UK investors are said to have increased their diversification of holdings across currencies in recent years, reducing their demand for sterling debt relative to other currencies. Until April 2015, retirees with defined contribution pensions were essentially required to purchase an annuity upon retirement. But they are now given greater flexibility over how to use their pension savings. This has reduced the flow of savings into annuities, which in turn has reduced the structural demand for long-dated sterling debt (which better matches annuity funds’ long-dated liabilities to annuitants). Leading annuity providers have forecasted that new business volumes for individual annuities will permanently fall by between 50% and 75% as a result of the changes, although this has been offset to some extent by growth in bulk purchase annuities. The euro developed into a major international market for corporate bond issuance shortly after its introduction, but sterling maintained an advantage for European companies when it came to issuing long-term debt. However, euro issuance in that category has been strong more recently: since 2013 about a fifth of new corporate debt with a maturity of 15 years or more was denominated in euros (Chart 3). The relative decline in euro long-term yields and credit spreads, in part due to ECB QE, probably contributed to this trend. However, contacts also pointed to more structural factors, in particular new regulation for EU insurers which means they are more likely to buy long-term assets like corporate bonds to match their long-term liabilities, much the way UK annuity funds do. There may thus be a steady demand for long-term euro debt, encouraging issuance in that segment. In turn, this might improve liquidity and therefore encourage yet more investor demand and issuance. As one contact put it, the euro long-term debt market has reached “critical mass”. Such a virtuous cycle would erode the traditional comparative advantage of sterling. The structural nature of some of these changes means that the sterling market may not regain its sheen. Indeed, some contacts expressed concerns about the long-term viability of the sterling bond market. They worried there could be a downward spiral of lower issuance leading to deteriorating liquidity. That means investors would want to be compensated for the risk that they cannot sell bonds when they need to, therefore increasing the costs of sterling bond issuance and encouraging companies to issue in other currencies, thus reducing liquidity even further. Many of the largest UK companies are highly-rated multinationals. These companies may not be much affected by a shrinking sterling market. They are well known to foreign investors and have good access to derivatives such as currency swaps, so can issue in foreign currencies relatively easily and swap the proceeds back to sterling when required. But not all UK companies have this option. Those with UK-focussed businesses might not be familiar to foreign investors and so the costs of marketing their bonds abroad could be prohibitive, especially for smaller issues. Furthermore, our market contacts reported that currency swaps used to avoid the exchange rate risk of foreign borrowing may be unaffordable to companies with a lower credit rating. Currency swaps involve a large exchange of funds (between the issuing company and the bank providing the swap) at the end of the swap. As a result, the bank runs credit risk on the company, and market participants say that post-crisis regulatory reform and evolution in bank risk management practices have led banks to charge companies more for this credit risk, with particularly high charges for lower-rated companies. Lower-rated UK companies may thus be consigned to issuing in sterling, even if this comes at a high cost. This may help explain why high yield bond issuance has bucked the trend of declining sterling issuance, as shown in Chart 2. However, if that just implies that some companies are trapped in more expensive sterling borrowing, while those that are able opt for issuance in other currencies, it hardly seems a sterling silver lining. David Elliott works in the Bank’s Sterling Markets Division. Menno Middeldorp worked on this post whilst working in the Bank’s Macrofinancial Analysis Division. Previous Post Modelling banking sector shocks and unconventional policy: new wine in old bottles? Next Post International business cycle synchronization: what is the role of financial linkages? The structural arguments here also imply growing difficulties for UK pension schemes – esp. defined benefit – to source assets to go with liabilities. Increased reliance on low-yield government issuance ahead?